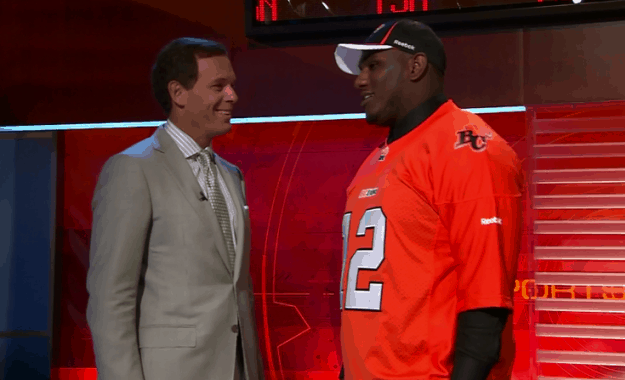 You are here: Home / CFL/League / 2012 BC Lions Draft Recap: Lions go to the trenches on draft day. 2012 BC Lions Draft Recap: Lions go to the trenches on draft day. The BC Lions had a chance to bolster their offensive and defensive lines in the 2012 Canadian College draft and they did just that selecting two offensive linemen, one defensive lineman and a linebacker they may convert into a fullback. Round one: Jabar Westerman :: Defensive Lineman :: Eastern Michigan :: 2nd overall pick via Toronto via Edmonton. The Lions had a chance to make some waves in the first round of the the 2012 Canadian college draft and they did just that. Holding two picks in the opening round, the Lions made a move early to ensure they got the man they wanted. After an earlier deal between Winnipeg and Hamilton saw the Bombers leap frog the Lions to get the 3rd pick, Wally Buono worked a deal with Edmonton to move from the 4th pick up to the 2nd and took Eastern Michigan defensive lineman Jabar Westerman, who was reportedly the reason Winnipeg had tried to move up. Westerman comes from a family of football players, with brother Jamaal playing LB for the Miami Dolphins and other brother Jawann played football at Rutgers but went undrafted today. “My greatest asset, I would say is my size and strength, just because how big I am – I’m almost 300-pounds – and I’m pretty quick for my size. Most people underestimate my speed,” said Westerman in describing himself as a football player. Westerman flew under the radar of many scouts because of some late clarification of his eligibility for the draft. Once he was deemed eligible, which was right before E-camp, his stock rose and the Lions were thrilled to get him. The trade left the Lions with just four picks on the day, but they got their man and that’s what it’s all about. Westerman brings an excellent balance of speed, strength and size to the Lions defensive line, and while he probably won’t see loads of playing time immediately, he will develop into one of the most – if not the most dominant interior Canadian defensive lineman in the CFL. Once he gets adjusted to the game and learns to use his size to break off the line and make big plays, he will be one to watch week in and week out. The Eastern Michigan product is very agile, but perhaps not quite the traditional DT. Looking forward to what he can bring at camp because of where the Lions staff believed he was worth the pick. With their 2nd pick in the draft and 7th overall, the Lions went to the other side of the ball and selected offensive lineman Kirby Fabien from the University of Calgary. The 21 year old oozes potential and talent and still has college eligibility left, giving the Lions some time to let him develop further. A training camp under Dan Dorazio won’t hurt, even if the team decides to return him to Calgary. Fabien has all the tools to have a long career in the CFL and could even be groomed to play the tackle spot, a position that is usually filled by imports. At 6’6″ and close to 300 pounds, he has a big long frame and Dan Dorazio will be drooling to get Fabien into camp to start his tutelage. Described as an intelligrnt player who picks things up very quickly, Fabien has been a three year starter for Calgary, twice being named a Canada West all-star. “When you look at his measurables, when you look at his length, how he moves, the thing about Kirby is he’s a big man and he moves and he’s light on his feet. He plays tackle and he can potentially grow at that position. But what you really like about him is, because I want intelligent football players, Kirby is a guy that steps in right away and he knows everything,” said head coach Mike Benevides. When you look at Fabien initially, you see a big body. He stands 6’6” and weighs approximately 300 pounds. At the age of 21 years old though, he will need some grooming and maturing before he is ready to take on a bigger role with the Lions. That’s where the Lions brilliant offensive line coach Dan Dorazio comes in. Dorazio has helped groom many offensive linemen over his previous nine seasons, and there is no reason to think that he won’t be able to do the same with Fabien. At this point I’m not sure if the Lions will commit to keeping Fabien around for the 2012 season, as he does still have eligibility left at the CIS level. If the Lions believe he can project to playing right tackle at the CFL level, I think they might return him to Calgary for this year and let him develop one more year while playing that spot for the Dinos. If they feel he is more suited to guard then perhaps they will keep him and let him learn from guys like Angus Reid, Dean Valli, Jesse Newman, and of course Dan Dorazio. Kirby Fabien (Calgary) a year ago was considered a lock for one of the top picks in the draft. His draft season didn’t match the years prior however he didn’t lose it all in a year. Strong pick with quickness to match. He should be able to take spot duty either as a guard or tackle. I totally believe that he has the ability to take a regular rotation even as a rookie and definitely as a second year player. When the Lions selected Matt Norman from Western, they saw a guy that can play guard, or perhaps be groomed to replace all-star Angus Reid who is nearing the end of his career. Norman is another big body at 6’3″ and 318 pounds and is quick on his feet for his size. Norman, who hails from Montreal, Que., played four collegiate seasons for the Mustangs and was a CIS First team All-Canadian in at the guard position in 2011. “When you look at his arms, he’s [got] over 34-inch arms, which is what you want. His hands are over 10 inches. That’s what you want. When you look at centre and guard, which is the position we’ve got to grow, he’s a perfect fit that way,” said Benevides regarding Norman. When you take a first glance at Norman you see a guy who could probably step into a CFL offensive line immediately and starting taking snaps. He is a big, strong, physical player who has a bit of a nasty edge to his game. He could still use some work on his technique and needs to be more consistent in the passing game, but overall is excellent value for the Lions in the 3rd round. Matt Norman out of Western is a leading pick that was expected to go earlier than the last pick of the 3rd round. Really has potential to show up as a regular guard down the road. May not be ready to start day 1 of camp but will be one to keep tabs on. Picking up Western offensive lineman Matt Norman in the third round (22nd overall) is also a solid move; Norman was a fixture on the CFL’s top 15 prospects list, and they were fortunate he lasted that long. Jordan Verdone was chosen by the Lions and for some he could be a sleeper pick in the draft. He was a linebacker in college, but according to Lowell Ullrich of The Province, the Lions are going to attempt to convert Verdone to a fullback. Verdone played two seasons at the University of Waterloo, sitting out the 2010 season along with the entire Warriors program. He was named the 2008 CIS rookie of the year after racking up 44 solo tackles. 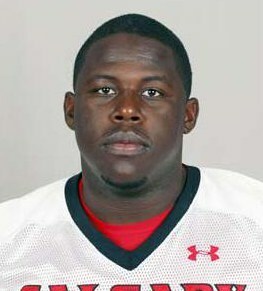 He was named Saint Mary’s College’s athlete of the year in 2008 and defensive MVP two seasons in a row. If Verdone is to make the Lions it will be with a strong performance on special teams, but with eligibility left, the Lions have options and time to mold him into the player that bests suits his talents in the CFL. I’m a fan of this Lions’ draft, but mostly because of the late picks. BC only had four picks following their trade up in the first round, but they made them count, and I think Calgary Dinos’ linebacker Jordan Verdone in particular is going to be a steal for them. Some had Verdone as one of the top LBs in this draft, so to grab him in the fifth round (37th overall) is tremendous value. I’m not quite sure how Verdone will fare on the defensive side of the ball in the CFL, but I do believe he will be an excellent special teams player for the Lions. He is a long-snapper, and that is something that the Lions are looking for after Dan McCullough elected to retire after winning the Grey Cup this past season. Verdone still has two years of eligibility left with the Dinos. Offenses around CanWest will be glad to see him in Lion Orange rather than Dino Red this fall. The former CIS Rookie of the Year at Waterloo before the big scandal destroyed that program, Jordan has been a force all over the field. He has special teams experience which should give him a heads up when it comes to duties as a CFL rookie.